^ Nossiter, Adam (March 10, 2018). "'Let Them Call You Racists': Bannon's Pep Talk to National Front". The New York Times. ISSN 0362-4331. Retrieved March 30, 2018. ^ Kingsley, Patrick (March 27, 2018). "How Viktor Orban Bends Hungarian Society to His Will". The New York Times. ISSN 0362-4331. Retrieved March 30, 2018. ^ "Steve Bannon, frozen out in the U.S., wants to foment a European populist uprising". Newsweek. March 10, 2018. Retrieved March 30, 2018. ^ "What Happens When Techno-Utopians Actually Run a Country". Wired. February 14, 2019. Retrieved February 15, 2019. 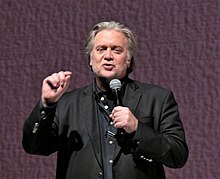 ^ a b "Steve Bannon's 'Movement' Enlists Italy's Most Powerful Politician". New York Times. September 7, 2018. ^ Berlin, David Charter (March 7, 2018). "German AfD party seeks Steve Bannon's help to fight 'fake news'". The Times. ISSN 0140-0460. Retrieved March 29, 2018. ^ "Trumps früherer Chefstratege will Europas Rechten zum Sieg verhelfen". Der Tagesspiegel (in German). September 22, 2018. Retrieved February 3, 2019. ^ Radosh, Ronald (February 4, 2017). "Steve Bannon's Shout-Out to a Left-Wing Terror Group". The Daily Beast. Retrieved March 30, 2018. ^ Edsall, Thomas B. (October 26, 2017). "Opinion | The Party of Lincoln Is Now the Party of Trump". The New York Times. ISSN 0362-4331. Retrieved March 30, 2018. ^ swissinfo.ch, Daniel Warner in Geneva,. "Why is Steve Bannon coming to Zurich?". SWI swissinfo.ch. Retrieved March 30, 2018. ^ "Breitbart's European coverage gives Identitarians the full embrace". Southern Poverty Law Center. Retrieved March 30, 2018. ^ "A Saudi Prince's Quest to Remake the Middle East". The New Yorker. April 9, 2018. ^ "Trump's chief strategist Steve Bannon fired". CNN. August 19, 2017. Retrieved April 18, 2018. ^ Zuidijk, Daniel (February 2, 2019). 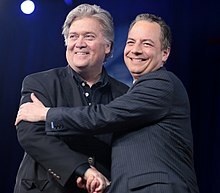 "Jair Bolsonaro's Son Joins Steve Bannon's Nationalist Alliance". Bloomberg. Retrieved February 3, 2019. ^ "Son of Brazil President Bolsonaro joins Steve Bannon group". France24. February 2, 2019. Retrieved February 3, 2019. ^ Shane, Scott (February 1, 2017). "Stephen Bannon in 2014: We Are at War With Radical Islam". The New York Times. Retrieved April 15, 2019. ^ Gold, Hadas; Bresnahan, John. "Trump campaign CEO once charged in domestic violence case". POLITICO. Retrieved April 23, 2019.